The winner of RAW in WAR’s third annual Anna Politkovskaya Award is the One Million Signatures Campaign for Equality (Iran). The grass roots campaign, launched in 2006, aims to collect one million signatures of Iranian nationals to a petition demanding an end to legal discrimination against women in Iran. Legislation for example, values evidence given by a woman in court as only worth half that given by a man. Girls under the age of 13 can be forced to marry once her father permits it. Women do not have equal rights with men when it comes to marriage, divorce, child custody and inheritance. Although campaigning peacefully and legally, activists are often subject to arbitrary arrests and imprisonment. The recent political protests have increased government pressure and persecution of those actively supporting the campaign. Charges against members range from acting against the national security of the state and propaganda against the state, to membership in the One Million Signatures Campaign itself. Many activists are serving suspended sentences and face regular harassment and persecution by the government. 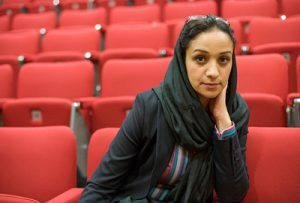 For example, on 14 June 2009, Shiva Nazarahari, a blogger and active member of the campaign was arrested in her home in Tehran following the post-election protests of June 2009. Held without access to a lawyer, she was released on bail for $200,000. One of her lawyers, women’s human rights defender Shadi Sadr, was pulled into a car and beaten by plain clothed security officers on 17 July, and also taken to Evin Prison, only to be released on 28 July. Leila Alikarami (pictured above), a lawyer and human rights activist, collected the Anna Politkovskaya Award on behalf of the Campaign. Alongside the 2003 Nobel Peace Prize Laureate Shirin Ebadi, Leila has defended many of the women members of the Campaign including Aliyeh Eghdam Doust, who was the first women’s rights activist in Iran to be imprisoned for the full term of her 3-year sentence. I am extremely pleased and honoured to accept this year’s Anna Politkovskaya Award on behalf of the One Million Signatures Campaign. This prize was inspired by a determined woman who was guided by her principles: fairness, justice, and freedom. For this, she paid with her life. This prize is an important recognition of the struggle of Iranian women to achieve equality. Today the world hears our voice as we cry out for justice. As recipients of this prize, we Iranian women are aware that, while honouring us, it also imposes responsibilities. This prize belongs to all Iranians who strive for women’s equality of rights. Iranian women have demanded equality for over a hundred years. Yet the laws continue to discriminate against them. Allow me to illustrate some examples. According to the Iranian criminal code, a woman’s life is worth half of a man’s life in terms of the compensation-known as blood money – paid to the family of the murdered individual. Secondly, a Muslim woman cannot marry a non-Muslim man, but an Iranian man can marry whomever he pleases. A third example: under Iranian law the nationality of a woman is not automatically transferred to her children. However, the same does not apply for a man. Consequently, there are approximately 20,000 children in Iran who lack a birth certificate simply because their fathers are not Iranian citizens, although their mothers are Iranian nationals. Furthermore, according to civil law an Iranian girl is not free to choose her husband. She is dependent upon the permission of her father or parental grandfather, regardless of her age. A final example: the age of criminal responsibility for girls is 9 while a boy cannot be prosecuted for a crime until he is 15. In fact, in Iran, a 9 year old girl is actually regarded as an adult woman. These are only a few examples of the inequalities and discriminatory practices in Iranian law, which are the object of our One-million-signatures Campaign launched in Iran in August 2006. It has been a serious struggle involving arrests and prison sentences. Newspapers and magazines which promote equality have been banned, and the campaign’s website has been blocked several times. Participation in peaceful, legal demonstrations has been a pretext for the arrest of many women activists. One such activist, Aliyeh Eghdam Doust, is currently serving a 3 years prison term. In the face of great difficulties we have continued to pursue our campaign for equality and human rights. We provided education on legal issues to the public, particularly to women, raised public awareness, promoted collaboration among groups demanding equality, and documented personal experiences. We work on a grass-roots level, collecting signatures and spreading information about the changes we believe must be made. Women have been increasingly high-profile and active in the protests which followed the official June 12 election results. This demonstrates that women, alongside the men, are actively participating in public life. The significant numbers of women demanding fairness and justice for their candidates cannot be denied. A young woman, Neda, was shot dead during one of these demonstrations. She became a symbol of the Iranian struggle for democracy. The presence of women in the elections, and the unrest that followed, demonstrates that women are now fighting for democracy alongside the men. According to one Islamic view, women should pray behind the men; this was the practice for a long time. But Iranian women broke this rule. For the first time, during the unrest, they took part in the Friday prayers next to the men, not behind them. We believe that Iran should respect and provide equal rights for women in all public and private spheres of life. Iran is a signatory to the International Convention on Civil and Political Rights and also to the International Convention on Economic and Social Rights, and we are committed to applying pressure on our government to live up to these commitments, including their guarantee of equal rights for women. In view of the political situation in Iran and the fact that our activities are viewed with suspicion, the campaign's coordinating committee has decided to turn down the cash prize, to remove such suspicions, and instead donate it to the award's foundation to be spent on the advancement of the human rights of women." I am delighted that this year’s Anna Politkovskaya award has been awarded to the one million signatures campaign. This award will support Iranian women in their struggle for equality. THE GUARDIAN: Iran's women are not afraid, by Shirin Ebadi (6 October 2009) Republished here. THE GUARDIAN: Women who fight for freedom , by Azar Nafisi (6 October 2009) Republished here.